1-CD with 36-page booklet, 22 tracks. Playing time approx. 54 mns. Bear Family's 1991 collection, 'Oklahoma Hills', has been one of our best-selling country CDs. Now we have the remainder of Jack Guthrie's brief, incendiary career captured on two incredible CDs. 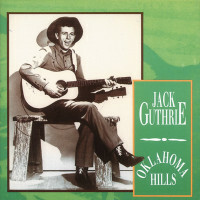 Jack Guthrie was the cousin of the legendary Woody Guthrie (indeed 'Oklahoma Hills' was Woody Guthrie's song, although Jack Guthrie took the credit), but Jack's sound was unlike Woody's. His bright western swing sound used the cream of the Los Angeles-based country jazz pickers, including Porky Freeman, Red Murrell, Billy Hughes, and Cliffie Stone. 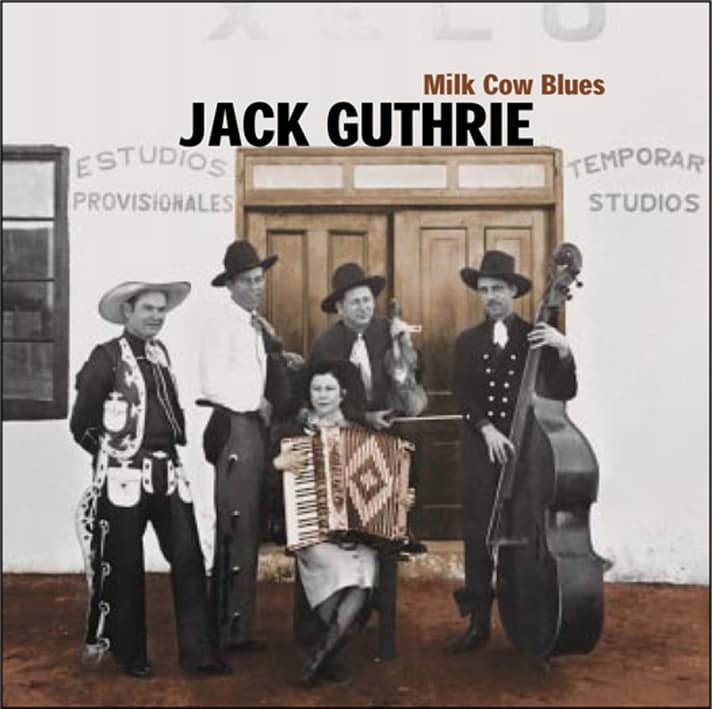 'Milk Cow Blues', drawn from previously unreleased transcriptions, includes several classic Jimmie Rodgers songs, such as Muleskinner Blues, Any Old Time, Waitin' For A Train, and My Rough And Rowdy Ways, all given a jazzy west coast feel. The set also includes fresh, vital versions of several Bob Wills classics, such as Home In San Antone and Maiden's Prayer, as well as traditional favorites like Footprints In The Snow and There's More Pretty Girls Than One. 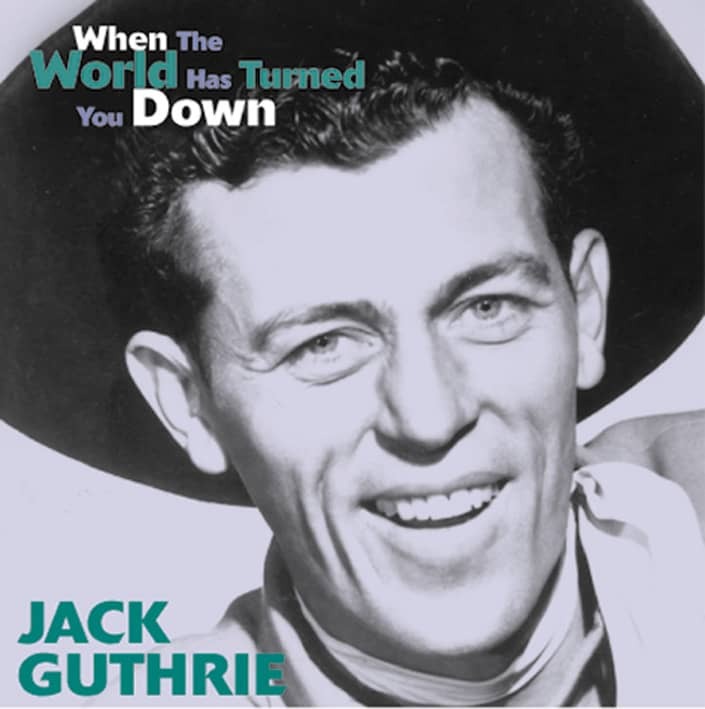 'When The World Has Turned You Down' features the remainder of Jack Guthrie's Capitol session recordings (none of them on 'Oklahoma Hills') as well as the remainder of his transcriptions. He revitalizes classic country hits from across the spectrum, including Roy Acuff's Low And Lonely, Ernest Tubb's You Nearly Lose Your Mind, Red Foley's Freight Train Blues, The Carter Family's I'm Thinking Tonight Of My Blue Eyes, and Bob Wills' Time Changes Everything and Take Me Back To Tulsa. As before, Jack Guthrie reinterprets traditional favorites like Birmingham Jail, Careless Love, and Trouble In Mind. 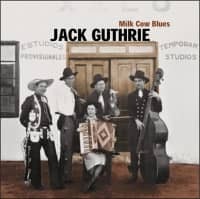 Both sets feature extensive notes from Guy Logsdon, who has carried out more than 40 years research into the elusive and tragically short-lived Jack Guthrie. When Jack Guthrie died of tuberculosis in 1948 (the disease that had claimed his idol Jimmie Rodgers), one of the most promising careers in west coast country music was over. Now his story is complete for the first time on Bear Family Records. The opening song in this collection, My Rough And Rowdy Ways, by Jimmie Rodgers and Elsie McWilliams has been referred to as a Rodgers autobiographical song; it definitely is the story of Jack Guthrie's short, productive life, for, indeed, he lived a rough and a rowdy life -- a lifestyle that he couldn't give up until tuberculosis robbed him of it. Born the son of a blacksmith in Olive, Oklahoma, 13 November 1915, and named Leon Jerry Guthrie, he grew up with a love of horses and the cowboy image. He also disliked his name -- his family always called him Leon -- it was not the name a cowboy would use. At some unknown time in California, when his cowboy singing career was beginning to bloom he chose Jack for his professional name. His father was John Camel Guthrie, a younger brother of Charley Guthrie, the father of Woody Guthrie who was three years older than Jack. The Guthries came from a cowboy/ranching family background in Texas; the uncle of Charley and John was Gid Guthrie, revered trail boss of the famous 101 Ranch, later located in Oklahoma Territory. Charley moved to Indian Territory in 1897 to work as a cowboy; John possibly followed his brother, for they both started families in the same general Oklahoma area. And both fathers were musical. 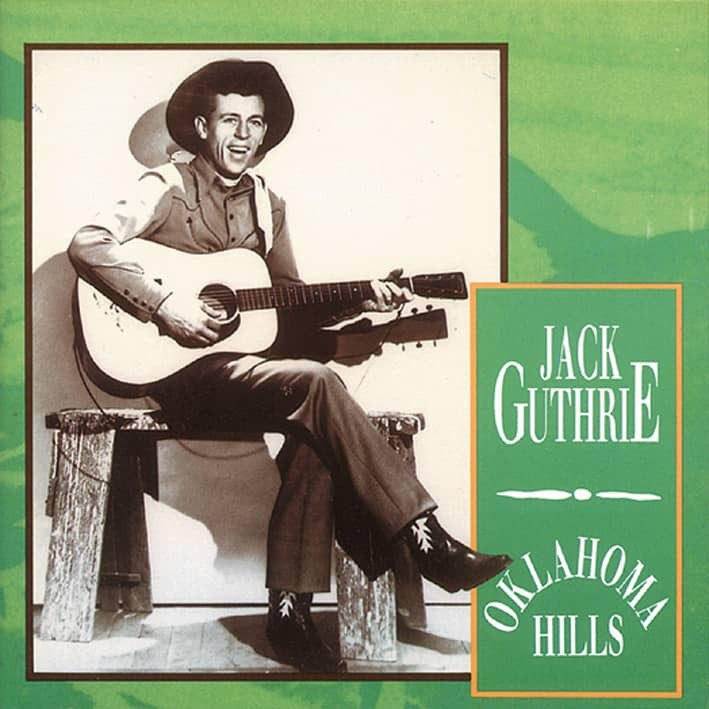 Jack's love of the cowboy life and cowboy singing was a Guthrie family tradition. In many ways he was a spoiled boy, for three older brothers died before his birth. His survival became a family goal, and his two sisters, especially Wava who was four years older, made him the center of life. They protected and cared for him; Wava recalled that he was "a good little boy....beautiful wavy hair...." In school he had problems, for they moved often, and the instability of migratory life caught up with him. Finally in his junior high years they were in Midlothian, Oklahoma and according to Wava, "Mom would take him to school; he would go in the front door and straight out the back door." That was the end of his formal education, and when he was in his late teens, they moved to California. During those years of family mobility, he learned to play the guitar, the fiddle, and the bass fiddle. They first lived in Los Angeles, but later moved to Sacramento. Jack was over six feet tall and slender with black wavy hair, so he easily found work; however, his love of horses and the rodeo and music led him into rodeo competition as a bronc rider and into singing in bars and clubs up and down the West Coast. This migratory work pattern created problems, for he had married at the age of nineteen and had a family. Jack met 'a beautiful blond,' Ruth Henderson, in a cafe where she worked as a waitress. Even though she was older than he and had been previously married, Jack and she were married a short time after they met. It was a turbulent marriage; if she went to a club where he was performing, it usually ended in an argument. They fought frequently and often lived apart. Jack had developed a bull whip act and trick roping act as a part of his club routine when space and management allowed it; in his whip act he would cut newspapers held in his partner's hand and pop cigarettes out of her mouth. Early in their marriage, Ruth was a part of his bull whip act, but as marital trouble grew, Jack occasionally missed. With scars from misses, Ruth quit as his partner, but he had no problem finding girls to work with him which added difficulties to their marriage. During the 1930s particularly in Oklahoma and Texas, the drought, dust storms, the Great Depression, and falling cotton prices were driving people off their farms, especially tenant and share cropper farmers, and out of small towns. Jack's cousin, Woody, had made his way to Pampa, Texas in 1929, and in mid-1937 along with thousands of other migrants he headed for California. However, his motive to make it to California was to become a country musician -- as with Jack, he wanted to make a living playing music. Jack and Woody decided to become a musical team, trying to capitalize on the developing country-western music and radio industries. Their singing and guitar styles were different. As is obvious in this collection, Jack's singing idol was Jimmie Rodgers; Woody's influence was the Carter Family, so they did not sing duets. They backed one another musically -- Woody usually played the harmonica while Jack sang to his own guitar accompaniment, and Jack played the fiddle or guitar during Woody's songs. They were an excellent and popular duo and not only were they cousins but also were good friends. Neither tried to upstage the other. They put together a pretty good stage act before Jack wangled an audition at KFVD Radio in Hollywood, which was a popular country music station featuring talent such as Cliffie Stone and Stuart Hamblen. On 19 July 1937 they played their first show – 'The Oklahoma and Woody Show' (Jack was known among friends as 'Oke' and 'Oklahoma'). It was well received by the radio listeners, and fan mail started coming in. It was a fifteen minute radio show that soon was changed to thirty minutes; then they were given two thirty minute shows a day. Customer evaluation for "When The World Has Turned You Down"